On November 25, Justice Stephen Kelleher of the B.C. Supreme Court ruled in favour of the Diocese of New Westminster against four congregations who left the Anglican Church of Canada (ACoc) in 2008 to join the Anglican Network in Canada (ANiC), which was one of the founding members of the Anglican Church in North America (ACNA). The congregations in question are St Matthew’s (Abbotsford), St Matthias & St Luke’s (Vancouver), St John’s Shaughnessy (Vancouver), and Church of the Good Shepherd (Vancouver). Mr Justice Kelleher preferred to follow American legal principles rather than apply British and Canadian cases which have held that “As a rule, where a church organization is formed for the purpose of promoting certain defined doctrines of religion, the church property which it acquires is impressed with a trust to carry out that purpose, and a majority cannot divert the property to inconsistent uses against the protest of a minority however small.” (See Anderson v. Gislason 1920 Man. CA) He also chose not to apply established British and Canadian “cy pres” trust principles in dealing with the church properties. There was, however, some small good news in the midst of the bad. Justice Kelleher ruled that $2.2 million that had been given in trust to the Good Shepherd congregation should remain in the hands of the ANiC congregation and not the diocese. This news story, while bitter-sweet, hits home particularly hard for me as I have friends in the St. John’s Shaughnessy congregation. Keep orthodox Anglicans and Episcopaleans in your prayers as they struggle against the oppression of their national church bodies. Roman Catholics only allow practising Roman Catholics in good standing to take communion. To be a practising Roman Catholic in good standing, one must follow all the teachings of the Roman Catholic Church. Congressman Patrick Kennedy refuses to follow all the teachings of the Roman Catholic Church. Therefore Congressman Kennedy cannot be a practising Roman Catholic in good standing. Therefore the Roman Catholic Church cannot commune him. The Congressman is certainly entitled to his own beliefs. But he is not entitled to force those beliefs upon a church body that does not agree. Nor can he force the church to change its official practice (regarding who should be communed) to accommodate his own heterodox beliefs. June 2004 – Bishop Frederick Henry of Calgary (Canada) publishes a pastoral letter decrying the “moral incoherence” of Prime Minister Paul Martin on such issues as homosexual marriage and abortion. The Bishop had previously called to task then Prime Minister Jean Chretien and then Conservative Party leader Joe Clark, and announced he would not serve them communion. He had even suggested that he himself would not preside at Clark’s funeral if the latter preceded him. March 2007 – Bishop Marcelino Hernandez announces that any Mexican politicians who vote in favour of a bill to legalize abortion will be excommunicated. May 2007 – Pope Benedict XVI issues a warning to Catholic politicians worldwide who deliberately flout the church’s position on abortion. September 2009 – Polish bishops issue a warning to politicians that if they support abortion, they face excommunication. November 2009 – Bishop Juan Antonio Martinez Camino, spokesman for Spain’s Bishops’ Conference, announces that any politicians who vote in favour of a bill to liberalize of abortion laws in the country will be automatically excommunicated and refused communion. 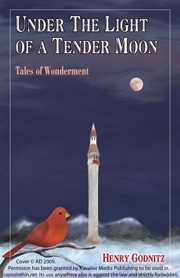 Earlier this month, Henry Godnitz’ first book Under the Light of a Tender Moon: Tales of Wonderment was released by Kavalier Media Publishing. While I could certainly point to the influences of Chesterton, Lewis and Tolkien on the book, particularly in its theoretical understanding of fantasy, perhaps this collection of short stories might best be described as Christian fairy tale in the tradition of George MacDonald. From within this literary environment, Godnitz presents a group of tales that centre around paradox. Here you will find juxtaposed the ancient with the contemporary, despair with hope, and the real with the fantastic. In contemporary society, the spheres of the real and the fabulous rarely meet. But there exists a moment, that fleeting second between sleep and wakefulness, when these two worlds seem to blend and become one. Such is the realm of Under the Light of a Tender Moon. Here, in tales of dragons and heroines, soldiers and jewellers, churches and castles, we are reminded that the “happily ever after” of both fairy tales and real life seldom comes without great travail and never without sacrifice. And yet, it cannot be denied that the sempiternal luminosity of the ending makes the pains of the quest infinitely worthwhile. If you’re looking for positive Christian fantasy, I sincerely recommend you consider Under the Light of a Tender Moon. The book can be purchased from Kavalier Media Publishing’s website here. Yesterday (November 10) marked the 526th anniversary of Martin Luther’s birthday. 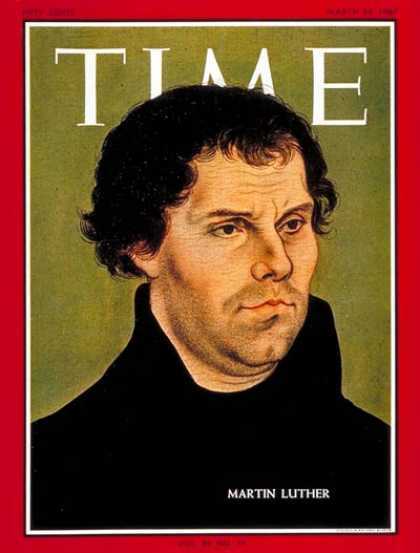 In honour of the event, I thought I’d post a link to Time Magazine’s March 24, 1967 cover article on Martin Luther entitled “Obedient Rebel.” It was published during the 450th anniversary of the Reformation. For reader response to the article, check out the Letters to the editor in the April. 27, 1967 issue. Enchant us still and speak for us. Be you the words upon our lips. Altered in form yet unaltered in meaning. Here the Word speaks over us. Here the Word speaks into us. And we in return respond in unison. What is this text that survives centuries and cultures and civilizations? What these words that they grip us still? Are they not of human origin? A message that bids us come experience grace anew. We do not speak these ancient words by mere rote. Those with whom we worship even now as we speak ancient words. Captain Thin is powered by	WordPress 5.0.4 and delivered to you in 0.499 seconds using 31 queries.